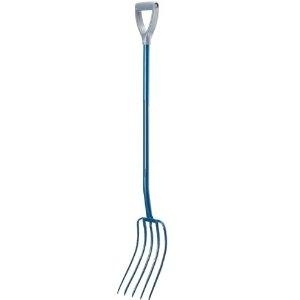 All Steel Manure Fork. 5 prong D handle. Blue in colour. This product is lighter than a mild steel alternative, easy to use and well balanced. Using the best high quality carbon forged heads designed for long life and strength. They are less likely to snap, shatter or bend and has a comfortable very strong plastis D handle.